Dreams are made to be followed and this is it, the moment of truth, every amateur hiker's dream. I schedule this day for Mt. Everest Base Camp trekking purpose only so as to ensure that my plan is perfectly executed. Despite the tremendous exhaustion of 13 consecutive days hiking and the defying the altitude sickness effects, I have to go by the mindset. The trail is a series of rocky ascent/descent with a little portion of icy rocks. I went to EBC early because most of the guided trekking group perform this hike in afternoon. 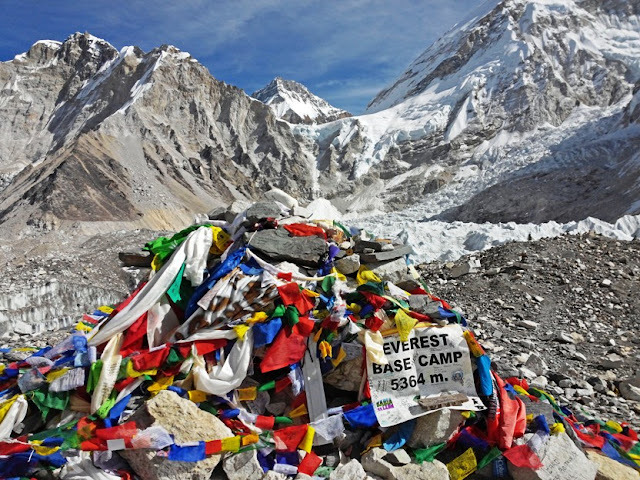 I arrived on the EBC area with only other 2 tourists with me. I let them finished first their photo-ops so that I can own the place for how many minutes. No signboard, I just follow the trail going north, I consider the trekking difficulty as easy.